The New Century School thinks Michael Owen and Scott Burkholder are what you might call “lovely” people. Together, these two are spreading (literally!) 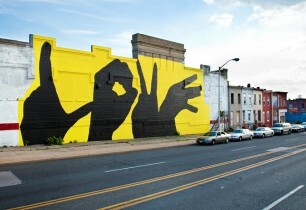 a message of community and social involvement across Baltimore City called the Baltimore Love Project. You may have received the memo without even realizing it. It comes in the form of a mural-sized silhouette of four disembodied hands spelling out L-O-V-E on the exterior walls of various city buildings. By the end of 2012, Baltimore neighborhoods will be graced with 20 such murals, ranging in size but all depicting the same striking image. It makes you stop and think, this image. 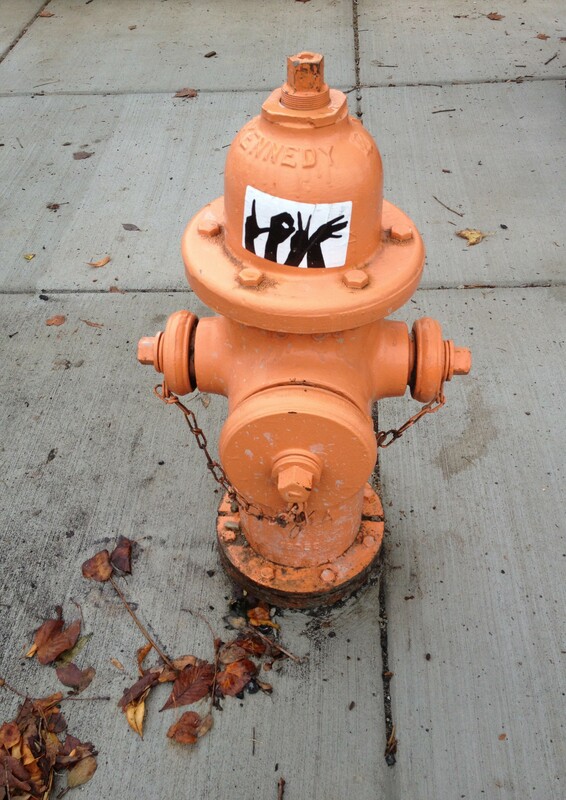 And that’s the whole point, according to Owen, the artist and project creator, and Burkholder, the Executive Director. “BLP is about helping people understand that public art matters and providing access to it. It’s a powerful platform for social change,” says Burkholder. To BLP, every street corner, city wall, and alleyway is a potential canvas, a canvas that should engage the community. “What might change,” asks Owen, if a powerful positive message was very publicly displayed for a city-wide audience? “What would people start to do differently?” What BPL wants is to instigate, to stir up some discussion. The art is, indeed, stirring, but it’s a very gentle confrontation. It’s certainly hard to be unaffected on some level by such a large, physical piece. It’s a challenge at its most basic level. “LOVE,” it simultaneously shouts and whispers–is it a command, or is it a request? Is it a dance? The work is deliberately minimal, says Owen. It’s a distillation–no details–so it speaks to all people, not any one particular group, yet it affects everyone a little differently. It’s a true democratizer. TNCS, in sharing very similar values of community and democracy, has formed what promises to become a very fruitful partnership with BLP. “Schools have become a big part of the project,” says Owen. “It’s a natural fit.” Schools provide the ideal point of engagement with the larger community. Moreover, school-age kids fairly bubble over with what he calls “unreserved excitement” to talk and respond with “raw thoughts about elemental things.” Like love, for example. Says Alicia Danyali, Head of TNCS , “The benefits of this partnership will not only allow the school to support community art projects, but will in turn enable us to develop educational opportunities for the entire TNCS community.” In exchange for TNCS selling BLP merchandise (available for purchase at TNCS’s online store) for fundraising, BLP will create one of their murals in the school’s name as well as provide some on-site education and maybe even some inspiration. Students will attend an assembly on public art and how the theme of love is represented, the primary and elementary classes will work together to create a school mural, and there may be a visit to Owen’s studio in the works to get a first-hand look at the process. TNCS and BLP are collaborating to make art and the social and cultural revolution it can inspire accessible to all. What’s not to love? 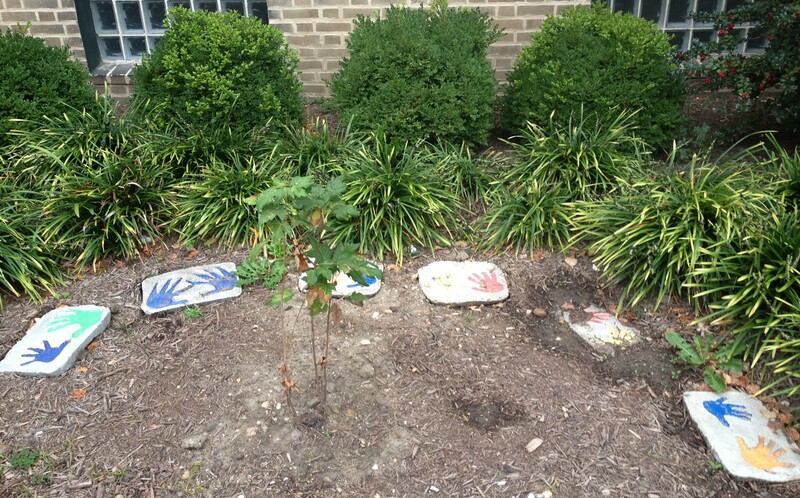 TNCS students make hand art, too! 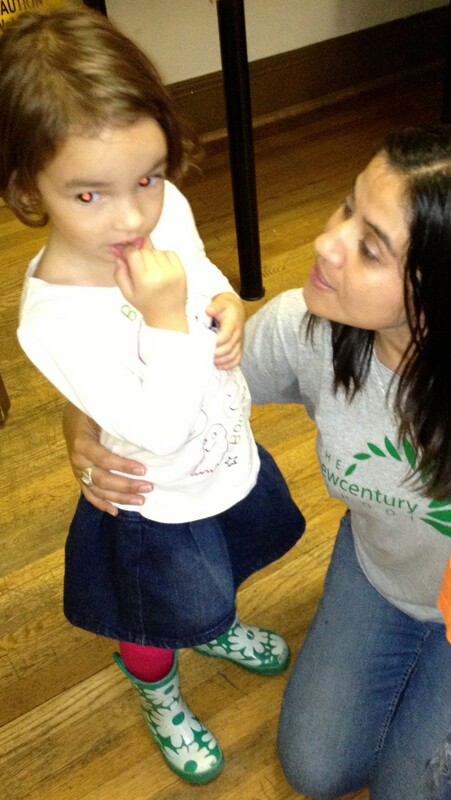 One of The New Century School’s core values is kindness. At the heart of their Montessori-based, yet progressive approach, is being kind to one another–it informs every interaction between teacher and student, between student and peer, and among faculty and administration. Children are not punished or labeled as “bad” when they behave counterproductively–such negative reinforcement is proven ineffective. Rather, they are taught the logical consequences of their actions, such that a disruptive child is removed from a group activity and allowed to pursue a solitary one–always with respect and always with a gentle, encouraging word. Well TNCS Parents, besides assuaging that natural parent anxiety about how your kids are treated when you’re not around to see, the kindness your kids receive at TNCS does more than give you and them that warm, fuzzy feeling–it’s actually making them smarter, too! A new study from the University of Pennsylvania finds that children who are lovingly nurtured at age 4 years have better developed left lateral cortices–the part of the brain that regulates semantic memory, processes word meanings, and develops general knowledge about the world–as adults. Furthermore, the researchers report that the cognitive stimulation a child gets from books, music, and educational toys also greatly influences brain development. Although this may come as no surprise to many, it’s nevertheless tremendously satisfying to actually see those measurable neurologic data. Even better, these benefits are reaped independently from genetics. It’s also tremendously satisfying to know that a child is getting both the nurturing interaction and cognitive stimulation in the TNCS classroom that he or she benefits so greatly from in the home environment. The TNCS faculty play a role that cannot be underestimated in helping our children develop mentally, socially, and emotionally. 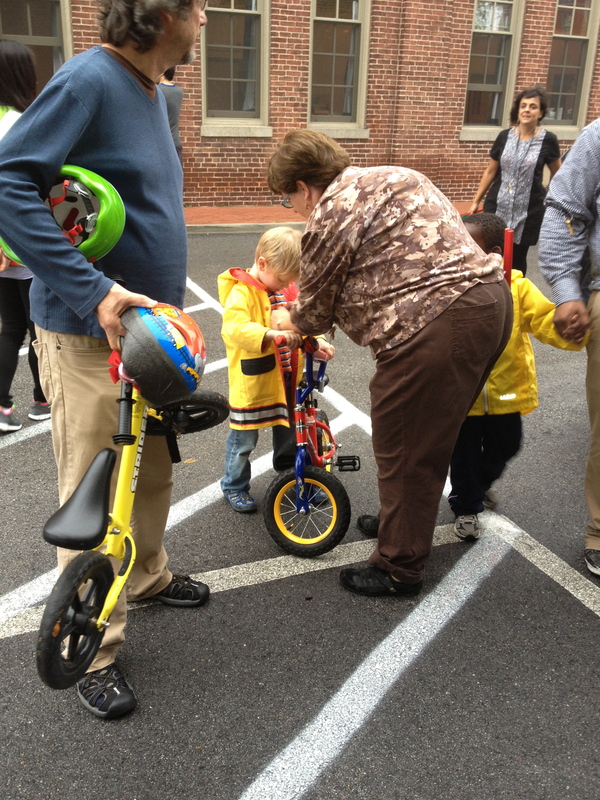 On Wednesday, October 3rd, 2012 students around the globe hit the sidewalks on foot, in strollers and wagons, and even on scooters and bikes to get to school. Partnering with the Downtown Baltimore Family Alliance, The New Century School joined in the International Walk to School Day fun. 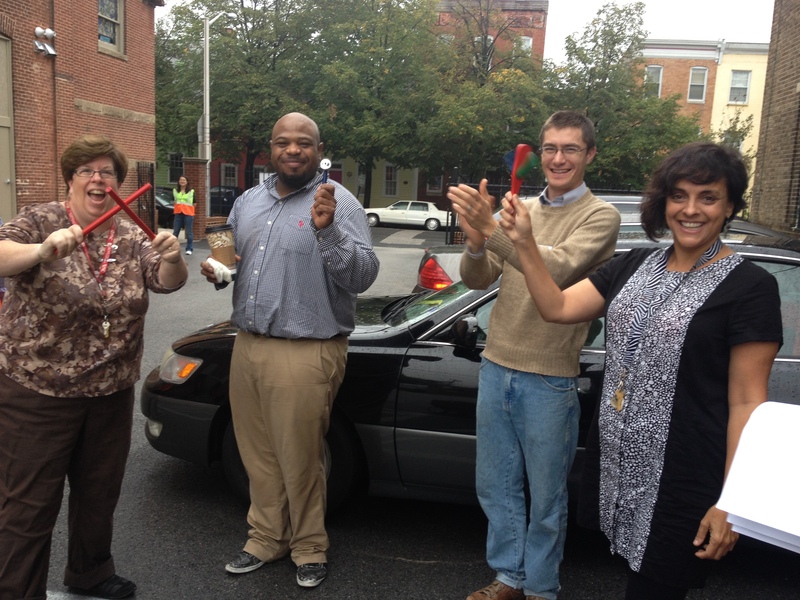 TNCS students and their families who walked through the entry gate to school were greeted with an exciting scene–teachers and faculty cheered them on with bells, whistles, and the tapping of rhythm sticks. The kids were thrilled to start the school day in such a festive way! Though the weather forecast that morning was not in our favor, 30 kids made the trek despite the threat of rain and the prevailing mist and fog! Many TNCS families are already dedicated walkers, but on learning about the event, some new families decided to give it a go. All in all, more than 25% of students currently enrolled at TNCS participated–which comes as no surprise given TNCS’s spirit of community and camaraderie. Students were given stickers to wear proclaiming their accomplishment, and all students brought home car stickers reminding drivers to Brake for Pedestrians. The event was a great way to demonstrate the value of choosing to walk rather than taking the car. For many of us, walking to school isn’t always practical, but walking to the market, to the kids’ soccer game, or to neighborhood points of interest are fun and convenient alternatives. You’ll be amazed at how differently you see your community! The point is to just get out and walk as close by or as far as you like! 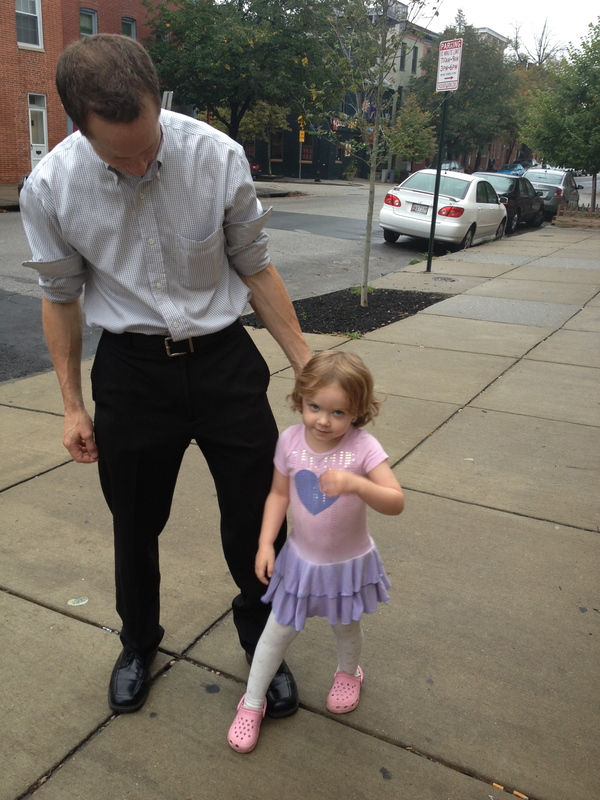 Join TNCS in taking steps for walking! 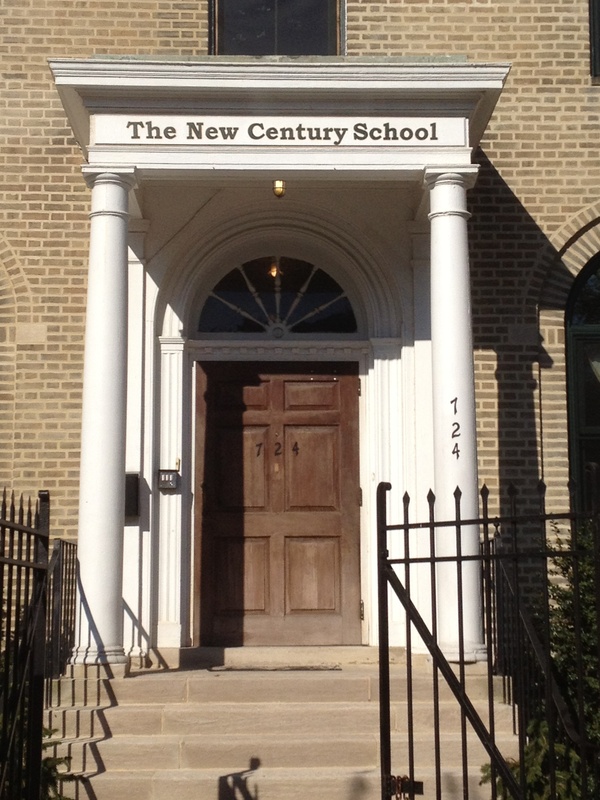 The New Century School (TNCS) is aptly named. It provides a learning environment that is in sync with the times–this is a new century after all, not to mention a new and changing world. To be responsible, conscientious, engaged members of that world, our children will benefit from a fresh approach to education. TNCS is about participating in a community, and community happens at both the micro and the macro levels. Students of TNCS learn appropriate interaction with one another in the classroom and throughout the school as well as how to navigate broader social contexts through immersion in other languages such as Spanish and Mandarin Chinese. The one-language model of education just won’t cut it in today’s global community. So, welcome, friends and families, to the inaugural edition of TNCS blog! We are thrilled to be officially up and running with what we hope becomes a forum to share language immersion and Montessori education–related news and research as well as to promote dialogue among readers. This blog’s mission is to explore what it means to be a Montessori-inspired language immersion school, what it means for the children to be attending such a progressive school, and what it means for the parents of those children. TNCS brings a distinctive flavor to language immersion and Montessori education in many ways, and we’ll explore those unique offerings, too! The 2012–2013 school year brings many exciting new things to TNCS. Stay tuned to learn all about these fantastic new features!